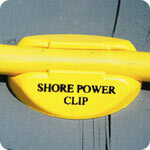 The safe and reliable way to secure electrical shore power cords in high traffic areas. Easy to install and use, the Dock Edge Shore Power Clip is designed to hold a sturdy 30 Amp marine power cord in its' low profile "toe-friendly" shape. This product comes with 4 clips per bag. Dimensions: 7in. x 6in. x 1in.